DMOZ, also knows as Open Directory Protect (OPD) is among the most significant website directories all around the world. A new webmaster always dreams to get listed in DMOZ (OPD) for the many benefits it brings back. If your blog or website gets listed in DMOZ, on next Google Page Rank update your site will be blessed with High Page Rank. Google relies on DMOZ heavily this is the reason why a website which is listed by DMOZ directory automatically gets listed in Google Directory. Getting your site listed in DMOZ directory is not as simple as you are thinking. Some time it seems like it’s impossible to get listed in DMOZ because each and every blog/website submission is volunteer by a human reviewer. Nevertheless, there is a way which will guaranty your site submission in DMOZ directory, and that is to become DMOZ Editor for that category in which you want your website to be listed. Appling to become a DMOZ Editor is as easy as you like. Getting accepted as an editor is harder then your thoughts, But every thing is doable. 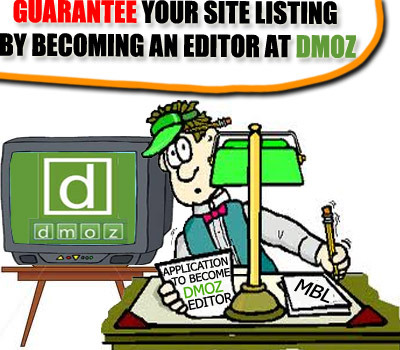 DMOZ will only approve you as an editor if you applied for only one category. But when you get fully approved as an editor you can apply for new categories. So it is really important to follow the Guidance (Rules) after you get approved as an editor. Don’t forgot to read out the basic guidance about the category before applying for it. Try to work activity as an editor and it will be easily for you to get approved for other categorize. The selection of the category is really crucial. Try to select a category which has less or no editor. Selecting a category with has few listed websites. STEP#1:The first thing you need to do is to find the best category for your website.When you discovers best category for your website simply scroll down to the end of that category page and there you will see a text link “Volunteer to edit this category” simply click it. This will take you to the next page which will give you the tips and all possible advices before applying for an Editor. Remember: To read the guidance carefully, don’t ignore it as it is highly recommended. STEP#3:Now you will able to see a application form, here you need to fill out your details. (your name, username, password, email address, etc.) Remember: Provide original details, if any of your details proved to be false then your application would be rejected. STEP#4:Further down the application form you will witness four boxes to input your important information. These four boxes will are very critical so when you are working on these four boxes its important to make sure you fill them correctly i.e. your punctuation, grammar, and spelling are all correct. I will guide you about each box one by one for perfect results. Now its time to showcase your true talent, in here insert a large list of your interests (CSS, HTML, Drupal, PHP/mySQL, Photoshop, XHTML and etc). Just keep it simple. I would not put that you are SEO you don’t really want to show DMOZ that you are applying for an editor to list you website. If you do so the reviewer who will review your application will think that you are only becoming editor to control search results, and they may not approve you. Why are you interested in volunteering to be an editor for the ODP? Fill this box carefully try to be honest in your application. Just fill out the information smartly don’t get too honest. For intense: You don’t want to tell the reviewer, that you are only applying for editor because you want to list your XYZ website. Instead, talk about the betterment of the community that how many high quality websites are still not listed in DMOZ due to the lack of the editors. Even the Bots are becoming so advanced, but still human reviewers have no substitution. You need to be honest here, don’t list any false information about you as some of the application can be very comprehensive and they will habitually find out if you are not trying to misinform them, Just try to list those sites on which you are working currently or had worked. Give some information about the site and your role on that website. Now till now the total time to get this far should be 1 or 2 hour. 30 minutes in reading the guidance (rules), and then 20 minutes each in filling the four boxes. There is a real good change that you may be reject in your first proposal so its important that you save all of your data in a Word or text document. So next time when you apply again you don’t need to scratch you brain again form starting. By protecting all the details it will allow you to know what mistakes you made previously. And it will also allow you to over come your mistakes. 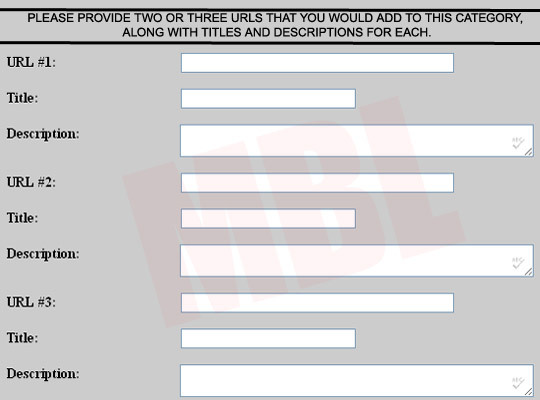 Please provide two or three URLs that you would add to this category, along with titles and descriptions for each. Search hard, go to your favorite search engine (in my opinion it should be Google) try to search most relevant website which fits your category perfectly. Make sure the sites are high quality and don’t have any affiliate system attached. Make a list of websites which you want to list and finalize final three from them. Remember: The content of every website should be original. Just work like an editor, don’t think you are just looking for website. Look for those website which are the best. The biggest reason why they ask you to list the website is to test your abilities of listing a website. So look for a highly professional website which is not listed in any category at DMOZ. Give perfect description to your selected websites. Don’t use any over blessed word in your description like “Quality” “Best” “Great” and etc. Follow the rule and regulation of submitting a website. This part of your application could take an hour or so. The toughest part of the application is to look for quality websites with original content and which is not listed already. So after filling out the all three websites press SUMBIT button and now you will receive an email from DMOZ for verification of your email (Which you inserted in the Application). Just follow your email and verify it. Now its time to wait and wait, the DMOZ reviewer will take about 4 to 6 hours to review your application. So it may take long as the time depends upon the application they receive daily. And if your application got accepted you can login to the category and can list your own website. Any one who is already a DMOZ editor then there is not much for you but those who are not could surly take benefits from it. So what are you waiting for, just prepare your perfect application and apply for an Editor keeping your fingers CROSS, Till then peace, blessings and happy applying.